In this exclusive, illustrated interview, Mary Pipher, Ph.D., discusses the challenges facing today's teenagers, especially girls, as well as the role of media and popular culture in shaping their identities. She offers concrete ideas for girls and boys, families, teachers, and schools to help girls free themselves from the toxic influences of today's media saturated culture. 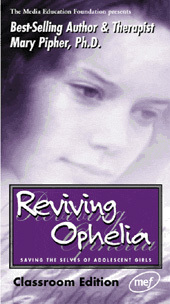 Reviving Ophelia is one of the most talked about books in America. On the New York Times best seller list since 1955, the book has spawned dozens of local discussion and action groups, internet chat groups, and community initiatives. Pipher's public appearances and workshops draw packed audiences of teachers, therapists, parents, guidance professionals, and others concerned about youth in our culture. This video presentation brings together ideas from Pipher's books and from her clinical practice in a highly accessible format.